Smaller IT organizations, such as those serving small-to-medium businesses (SMBs) and departments within larger organizations, must deliver world-class service on a small company budget. With increasing financial pressures and constraints, an already overworked staff and ever-increasing customer expectations, you know that getting the most out of every minute and dollar is crucial to survival and growth. Unlike larger enterprises that have significant resources to develop and maintain IT processes, you must concentrate on your core business before thinking about IT best practices. This can force you into merely “fighting fires” rather than taking a structured and pragmatic approach to delivering business value. 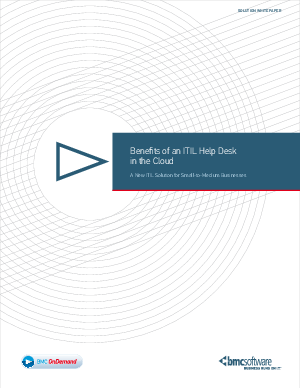 You struggle with the cost and effort of upgrading help desk applications — and justifying the up-front investment they require in hardware, software, and staff — while knowing they can help you in the long run through lower management costs and improved visibility into the delivery of IT services.